Pathways to Stem Cell Science | Pathways Inaugural Summer School gets off to a Great Start! Pathways Inaugural Summer School gets off to a Great Start! 01 Sep Pathways Inaugural Summer School gets off to a Great Start! By Marie Rippon, CEO LabLaunch. This summer, while other students advanced to level 47 in their favorite video games, 59 college and high school students were taking part in stem cell research programs with Pathways to Stem Cell Science. Founded and run by Dr. Victoria Fox, Pathways is the only organization that teaches students to work with stem cells hands-on outside of university courses and laboratories. This allows a myriad of students to study cutting-edge science and gain valuable skills that they might otherwise not have the opportunity to learn. This was Pathways’ first summer of programs, and already there is a demand for more. The success of Pathways’ programs owes much to Fox’s 15 years of experience working with human stem cells. She began developing her stem cell based training programs, the CIRM Bridges Training Program and the Early Investigator High School (EiHS) Program, as Director of USC’s Stem Cell Core. These programs were recently spun out of USC to form the new non-profit institute Pathways to Stem Cell Science. This year was Pathways first summer running as an independent organization and already Fox has plans to expand her courses to all grades including pre-school. Fox created Pathways to Stem Cell Science to address the growing need and demand for aspiring scientist to gain real-world hands-on training that cannot be provided within the confines of a school or university setting. “Pathways to Stem Cell Science is founded on the belief that science is an applied subject which should be taught hands-on in a professional laboratory setting. So many educational programs focus only on the theory of science without providing good quality laboratory based training in essential bioscience skills. At Pathways to Stem Cell Science we are trying to address this issue by brining students into a professional lab setting and providing them with real-world training for future college and career applications” says Fox. Forty-two students from five California State University campuses and one community college took part in this summer’s CIRM Bridges Program at the Johanna B. Gunter Stem Cell Training Laboratory at LabLaunch-Monrovia. Students learned techniques that are being used in the world’s top stem cell laboratories—skills which will help them be competitive in life science careers and graduate programs. 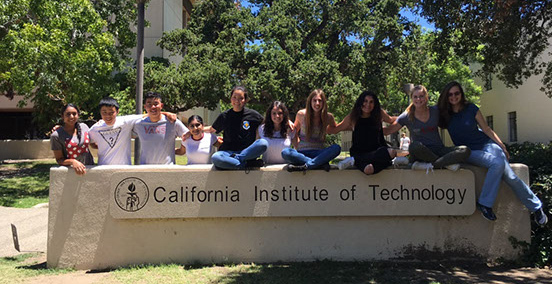 Ten high school students participated in the EiHS Program’s Regenerative Medicine and Disease Modeling Program held at the Caltech mouse transgenic core facility and seven students participated in the EiHS Research Internship Program. A CIRM SPARK grant, operated in collaboration with Dr. Henry Lester at Caltech, funded four scholarship recipients from Lifeline Education Charter School in Compton and Animo Leadership Charter High School in Inglewood. In addition, to learning molecular biology and cell culture skills, students derived beating heart cells from stem cells, an experience that left a lasting impact. To finish the summer, EiHS research students designed and presented scientific posters at Caltech, to an audience of professional scientists, family, and peers. The four EiHS scholarship recipients also took part in the statewide CIRM SPARK conference in Oakland, one winning the prize for the best blog. After a successful summer, Pathways is getting ready for the school year with programs that will continue to inspire the next generation of scientists.